Russia is planning to build the space observatory and an ultramodern telescope that will protect Earth from asteroids. The Astronomical Institute at the Russian Academy of Sciences (RAS) and the Cometa Corporation have begun researching the creation of a system for detecting and monitoring dangerous asteroids and comets. The project includes building a telescope and the Nebosvod (Dome of the sky) space observatory, which will be able to locate asteroids larger than 50 meters at a distance of one astronomical unit, which is equal to the distance between Earth and the Sun. The project will also protect Earth from celestial bodies such as the Chelyabinsk meteorite. 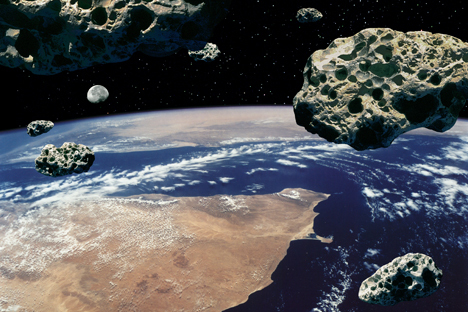 The national system will be integrated into the International Asteroid Warning Network. Director of the RAS Astronomical Institute Boris Shustov spoke to RIR about the project's particularities. RIR: What stage is this protective system at? Boris Shustov: The Nebosvod observatory is being developed by the Cometa Corporation in collaboration with the RAS Astronomical Institute and the Sternberg Astronomical Institute at the Moscow State University. The documents for the project have already been prepared and are titled, "Concepts for a National System of Countering Space Threats." But in order to build the system we need serious financing from the government. It is important to create an effective service that would guarantee constant monitoring to locate any hazardous space bodies in advance. The Ministry of Emergency Situations is actively engaged in the issue. Scientific research has been carried out in recent years with the aim of developing the necessary principles and models for creating an information-analytical center to counter asteroids and other space threats. RIR: Will the new system focus only on asteroids that are threatening Russian territory? B.S. : Dangerous asteroids and comets are "apolitical." They can fall on any country. That is why each national system must be integrated into a world network. Such a network is now being developed. It is called the International Asteroid Warning Network (IAWN). I am Russia's representative on the network's coordination committee. RIR: How soon will Russia be able to join IAWN? B.S. : Every country must make its own contribution to the cooperation. Some of our observers participate in the Minor Planet Center network. It is located in the U.S., is financed by NASA and works under the aegis of the International Astronomical Union. But we would like to cooperate internationally with our own national center. The Nebosvod observatory with its new powerful telescope would be able to combine the work of all the current Russian observatories and become this national center. RIR: Which Russian telescopes today are "protecting” Earth? B.S. : Under the patronage of the Federal Space Agency, Russia is developing a network to monitor industrial objects that constitute a daily threat to space activity. Small telescopes with a diameter of up to half a meter are looking out for dangerous asteroids and comets. A large specialized ground-based telescope is being completed for an observatory in Siberia, near Irkutsk. We hope that it will see its first stars next year. But still, it will not be enough. To efficiently detect real threats we need an expensive telescope and the Nebosvod observatory.